Back when I started PintLog, one of the first beers I reviewed was bottled Young's Double Chocolate Stout (you can check out that review here). Since then, it has consistently been the most popular review here on the website, so I thought that I should finally get around to reviewing the other version available on American beer shelves. 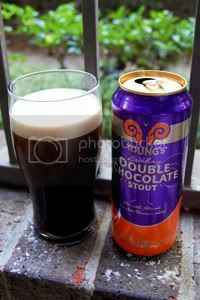 Like many popular British beers, Young's Double Chocolate Stout is also available in tall, nitrogenated cans. Compared to carbonated beers, beers that utilize nitrogen have a much smoother mouthfeel with a thicker and creamier head. So, let's pull the tab and see how the widget changes this beer. Appearance: A deep brown, almost black, body with brown highlights. On top a caramel-tinged, beautifully creamy, and dense nitro-assisted head that leaves brilliant curtains of lacing. Gorgeous presentation. Aroma: Tons of milk chocolate and roasted malt. Not much else comes though, but that's okay. Taste: Sweet, roasty malt with plenty of big notes of British milk-chocolate. Notes of toffee and coffee are also present, though in much lower amounts. There's a little hop bitterness towards the end to offer a bit of additional depth. Not thin, but not amazingly intense either. The aftertaste is sweet and roasty. Mouthfeel: A body that's perhaps a little fuller than medium with smooth, light "carbonation." The "carbonation" level seems to be a little below the already low levels typical to beers served from a nitro-can, making it just a little flat. Coats the mouth a bit. Drinkability: With moderate alcohol content, a relatively mild flavor profile, and a smooth mouthfeel this makes for a very sessionable brew. Verdict: Young's Double Chocolate Stout is popular for good reason - it's a solid, sessionable Stout with a nice focus on chocolate flavors. As for whether it's better carbonated in a bottle or nitrogenated in a can, it's a tough call for me. While I certainly appreciate the smooth mouthfeel here, and feel that it compliments the flavor profile well, it just seems a little too flat to really top the carbonated version. It's pretty much a toss-up - but if forced to choose, I think I'd go with the carbonated bottle. I certainly didn't expect that!